I got to be a part of a really great Halloween party last year! 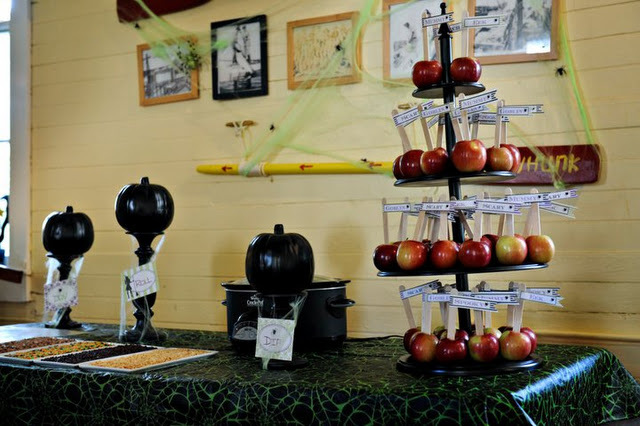 There were tons of fabulous Halloweeny elements to the party (I posted about them here) my favorite though was this make your own caramel apple bar I designed. The cupcake stand and some little funkins got a coat of black spray paint, some spooky spider webs, and a sweet TomKat Studios printables set were the perfect stage for the sweets. Nothing draws a crowd at a kids party like a crock pot of gooey caramel sauce & candy toppings to roll your apple in! After 4 years of blogging (i.e. writing a crafting/sewing/bento/party diary that just so happens to be shared with the world) I decided it was time to figure out exactly what I'm doing and/or should be doing with this whole blogging thing, so I'm in Atlanta today for Bloggy Boot Camp. Here's to a day of motivation, inspiration, and owning the title of "blogger"! Speaking of, Atlanta isn't owning up to its"hotlanta" title this morning... I parked 2 blocks away and am pretty sure one of my toes has frost bite. Despite my lack of recent blog posts, I've been crafting and sewing away & have lots of stuff to show you! Like, the sweetest princess inspired backpack ever, tons of appliqued boy onesies (you'll see... boy stuff can be cute too! 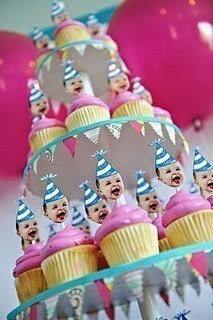 ), photo blocks, details about the cake stand I made for Liv's party, and bentos bentos bentos. So much good stuff, I just need to find the time to post it all! But you'll have to wait for all of that because today I'm posting about the outfits I made for my cuties to wear to Disney. Elle's 6th birthday was last week, so we celebrated by heading to Disney with our good friends whose 5 year old was also celebrating a birthday that week. sorry for the crappy picture! It's of course the way it should be... you know... a trip to Disney where your camera decides to mess up in a way that it never has and over expose every picture. I made both of the big girls birthday outfits using this skirt tutorial and simple number appliques I added to the Ts I picked up at Target. Liv's pillowcase dress came together quickly using this tutorial. unhook the tab on the party hat so you can open it up and lay it flat. run a bead of hot glue along the inside edge of the hat, pull the fabric around the edge of the hat and press it into the glue. repeat until all the raw edges of the fabric are glued down to the inside edge of the hat. Disney is already the happiest place on earth, but when everyone stops to say happy birthday and tell you how adorable you look... it makes it magical!